Whenever an oxygen atom is attached to carbon atoms of a carbon chain making a three membered ring, the compound are known as Epoxides. 2) Ethylene oxide can be prepared via treating ethylene chlorohydrins by potassium hydroxide. Epoxy ethane is a gas at ordinary temperature. They are very reactive and the ring opens at different reactions. i) Conversion to 1, 2-diol: Whenever treated with dilute acid solution, Epoxides are transformed to 1, 2-diol. ii) Epoxides react by alcohols in the presence of small amount of acid catalyst to form the monoethers. iv) Epoxides react by hydrogen cyanide, HCN, to form the ethylene cyanohydrins. i) Reaction by sodium ethoxide: The Epoxides react by sodium ethoxide to give 2-ethoxy ethanol (that is, ethyl cellosive). ii) Epoxides react by methanol under pressure to form 2-methoxy ethanol (methyl cellosolve). iii) Epoxides react by cellosolves to form carbitols. 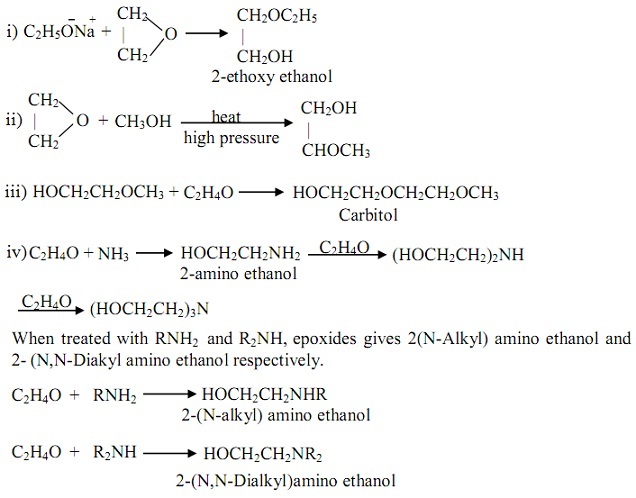 iv) Reaction by ammonia: Ammonia reacts by Epoxides to give 2-amino ethanol. 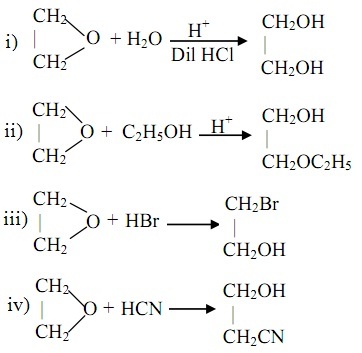 This reaction generally forms a mixture of three amino acids. Epoxides are oxidized to α-hydroxyl ketones through dimethyl sulphoxide. Epoxides react by ethanoic acid to make glycol monoethanoate. Epoxides go through rearrangement on heating to form the ethanal. Whenever heated with ethane-1, 2-diol (that is, ethelene glycol) epoxide forms the diethelene glycol. 1) Epoxides are utilized as fumigant and insecticides for grain, tobacco and dried fruits. 2) They are basically employed in the preparation of glycol ethers which are used as industrial solvents. 3) Methyl cellosolve, ethyl cellosolve and butyl cellosolve are used as solvents for the cellulose. 4) Epoxides are employed in the manufacture of non-ionic surface active agents. 5) Plyethylene glycols made up from Epoxides are employed as industrial solvents.